If you can make it to the Middle Tennessee State University campus in Murfreesboro, TN, tomorrow, be sure to catch the stellar line-up of Kerri French, Amie Whittemore, and Bryanna Licciardi reading their poetry in the Phillips Bookstore in the MTSU Student Union at 3 p.m. There will be a book signing after the reading. 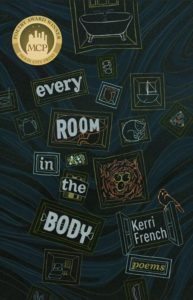 Kerri’s collection Every Room in the Body won the 2016 Moon City Poetry Award.